Mr. Goodnight, one of the founders of Maranatha Christian Academy, and the first Principal, ascended to his Heavenly home on Wednesday, December 12, 2018. 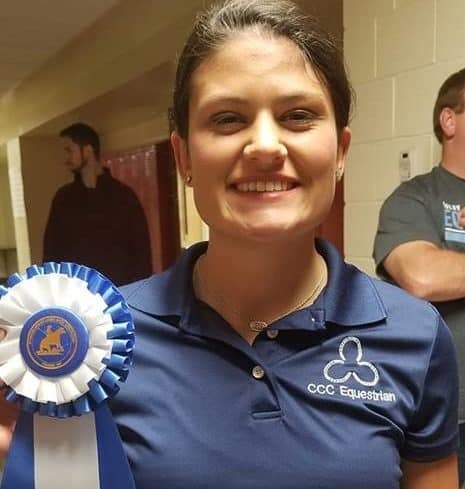 Congratulations to MCA Alumna Savannah Shiner for her outstanding performance in her Equestrian competition at the University of Nebraska! 3 for 3! Another Blue (1st). Read more about Savannah at Colby Community College and follow her success! Freshman beginner rider Savannah Shiner went undefeated over the weekend and won both of her classes. Earlier this year, we shared about MCA graduate Anna Hoduski and her race across the country in support of equality for the unborn. She discovered her pro-life passion as a fifth grade student at Maranatha, and that passion has fueled Project If Life. With more than 1,700 miles run and 800 miles biked, Anna and her team are nearing the finish line. Their 15-month missions trip will culminate October 15, 2017, at the Lincoln Memorial, where they will share their message. Project If Life launched July 23, 2016, in Kansas City. Anna, along with her sister Sarah-Marie, brother Nick and college friend Megan, ran from Kansas City to California. They shared the Gospel of Jesus Christ and advocated for the unborn every step of the way. Over the course of their journey, they have shared their pro-life message at 60 venues. “Maranatha did not just teach their curriculum from a Christian worldview, but taught me the importance of possessing and developing a Christian worldview myself,” Anna says. Maranatha is not only an integral part of Anna’s life, but central for her family as well: all Hoduski children are MCA alumni, and Anna’s father Mr. Hoduski is a beloved Maranatha teacher. Maranatha exists to educate, nurture and train students for Godliness and excellence, so they’re equipped to transform their world for Jesus Christ. Anna is just one example of our graduates who stand strong in their faith and boldly share their Biblical worldview. We’re proud of the example that so many graduates set for today’s students. Please join us in cheering for Project If Life as the team approaches the finish line! Anna Hoduski along with her brother Nick, sister Sarah Marie (all MCA alumns) and friend Megan Maier are being world changers for Jesus Christ. They have a passion to make a difference in the millions of defenseless babies who are yet unborn who will be murdered under the protection of U.S. laws. Watch this video to hear their story. Join them in a stand for the defenseless. Did Carter Williams play too nice on ‘Survivor’? …One “Survivor” moment had competitor (and “Facts of Life” star) Lisa Whelchel ruminating that if Jesus played the game, he’d play like Carter.